PhpDock is a deployment platform for PHP applications. PhpDock enables you to deploy any PHP web application as a Stand Alone Windows Desktop application w/o any changes in the code. PhpDock combines NuSphere's powerful embeded Srv webserver and browser components. With PhpDock, your php applications will work right out of the box. There's no need to provide long and complicated instructions on Apache and Php installation to your clients. PhpDock site license lets you distribute this deployment solution along with your php applications to provide easy and comprehensive installation and instant functioning of your php scripts. All you need to do is place PHP scripts in the document root directory of PhpDock - now your users can run your PHP web application without the webserver, browser or even Internet connection at all. PhpDock is a Web Server and Web Browser combined in one, small executable, capable of both running PHP scripts and rendering resulting HTML in the application Window. With PhpDock you can deploy the same PHP or HTML application both on the central Web Server and on each client as a Desktop application. Even though it is less than 1mb in size, PhpDock provides Web Server capable of fully running PHP and serving over 140 other types of files. PhpDock provides configuration file, which gives you control over running PHP scripts and browser behavior. PhpDock installation program also installs PhpDock Currency Converter - simple but very educational PHP Application, which uses PHP NuSoap webservices class to get currency exchange rates and provides the User Interface for currency conversion. PhpDock Currency Converter PHP Application is deployed with PhpDock and works in both on-line and off-line mode. 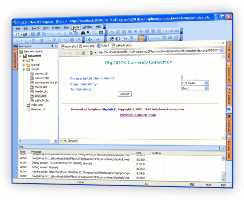 Currency Converter is developed in PhpED PHP IDE, using PhpED's NuSoap Client and DB Connection client. Learn more about PhpDock Currency converter. Download a free trial of the unique Php Deployment Solution from NuSphere. PhpDock - unique solution for php deployment - is available from our online store front. "Utilizing PHPDock was especially convenient because it lead to the deployment of a single code base to online web servers and offline computers. Moreover, with many different online applications already written in PHP at SALTO-YOUTH, using PHP for this application allowed PHP to be retained as the single programming language."